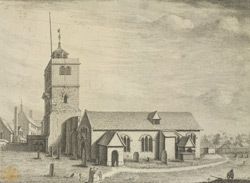 This engraving is of the old St Leonard's Church in Shoreditch parish. It was founded in the 12th century. It lasted until 1716, when part of the tower collapsed during a service.